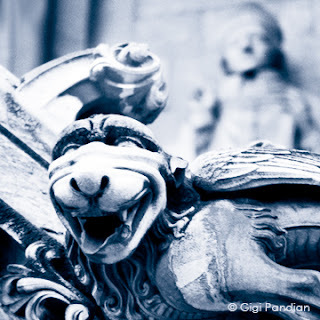 Gargoyle Girl: What is a Gargoyle Anyway? What is a Gargoyle Anyway? Technically, a gargoyle is a stone grotesque on the side of a building with a very specific feature: a waterspout for its mouth. It's from the French 'gargouille,' meaning throat, which is also how we get the word 'gargle'. The purpose of the gargoyle, in architectural terms, is to carry rainwater away from the building via a more artistic form than a drain pipe. Like this fellow below, at Westminister Abbey in London (with the saint looking out from behind). But that architectural understanding leaves us with a pretty narrow definition. In common usage, the word gargoyle more broadly describes any ornamental grotesque carved in stone. That's the way I use the term gargoyle. One of the most iconic gargoyles isn't technically a gargoyle. 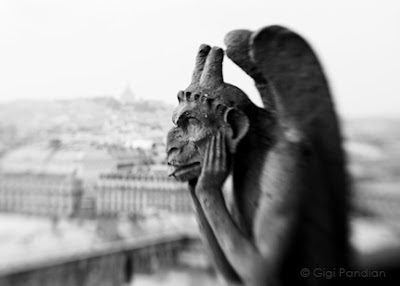 Le Penseur ("The Thinker") is one of many non-waterspout gargoyles that sits high atop Notre Dame Cathedral in Paris. Gargoyles now adorn many types of buildings, but as the examples above show, churches are important in their history. There are different interpretations about their original meaning, though. One understanding is that gargoyles represented demons and were meant to frighten people into attending church, which was a sanctuary from the demonic forces outside. Another interpretation is that the gargoyles themselves warded off evil. Since countless artists and patrons were essential in creating unique carvings before the era of mass-produced statues, it's likely a combination of factors across time and locations. I'm in awe of the visions of the people involved and their stone creations that have endured over the centuries. I love gargoyles and love the "Gargoyle Girl" moniker. Such fun! Looking forward to seeing more. 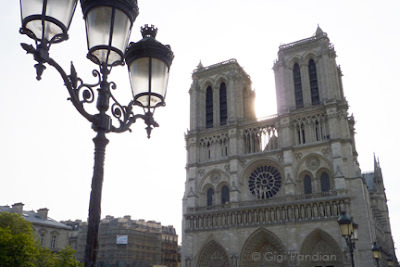 Fran - Yes, there are such fascinating animal combinations on those Notre Dame gargoyles. I'll post some more Notre Dame chimeras tomorrow.